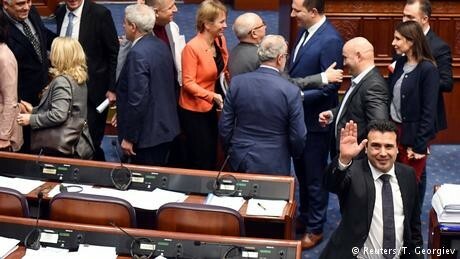 Over two-thirds of the parliament in Skopje voted in favor of renaming their country "North Macedonia" on Friday, passing the threshold required for amending the constitution in the Balkan country. The move aims to settle the decades-long dispute with Greece over Macedonia's name, with Athens claiming that the name implies territorial claims on the Greek province of Macedonia and accusing the authorities in Skopje of trying to link their Slavic nation with Alexander the Great. Greece has been blocking Macedonia from joining NATO and the EU over the issue. Addressing deputies in Skopje, Macedonian Prime Minister Zoran Zaev said the vote would "open the doors to the future, Macedonia's European future." NATO and the European Union welcomed the decision which both organizations had backed. NATO leader Jens Stoltenberg said it was "an important contribution to a stable and prosperous region." Foreign policy chief Federica Mogherini congratulated the parliament and said the EU "remains firmly committed to continue to fully support and accompany (Macedonia) towards its common strategic goal of EU integration." However, the name change will only go into effect if Greek lawmakers ratify the 2018 accord between Zaev and Greek Prime Minister Alexis Tsipras. This is far from certain, as many Greek nationalists object to any mention of "Macedonia" in the name of the neighboring country. Following Friday's decision, Tsipras "congratulated Mr. Zaev on the successful conclusion of the process to revise the constitution," the Greek prime minister's office said. Some conservative lawmakers accused the government of offering millions in bribes in exchange for votes. Zaev's party denied the claims and pledged to respond with legal action.